Home » Criticise vs. Criticize – What’s the Difference? Spelling differences between American and British English are common. See labor/labour, honor/honour, color/colour, etc. The history of these spelling differences is fascinating to some people, but if you are looking for simple advice on whether to use criticise or criticize, it might be more information that you need. Suffice it to say that both of these spellings are acceptable, but one is clearly preferred. What is the Difference Between Criticise and Criticize? In this post, I will compare criticise vs. criticize. I will use each of these words in at least one example sentence, so you can see how it appears in context. Plus, I will show you a helpful memory tool that will allow you to choose either criticise or criticize correctly every time. What does criticize mean? Criticize is a verb that means to judge something by its faults. It is related to the noun critic, or one who judges things. A film critic might criticize a movie by pointing out its poor writing, uneven pace, amateurish acting, or shoddy special effects. A boss might criticize his or her employee’s performance, whether justly or unjustly. Criticize is a regular verb, which means it follows the standard rules for conjugation of English verbs. “I’m tired of you criticizing everything I do around here!” Julia complained to Eric. Gary asked Melanie to constructively criticize an essay he had written for his English class, so that he could use her advice to improve his writing. What doe criticise mean? Criticise is an alternative spelling of the same word. It means the same thing and can be used in all the same contexts. The only difference between these words is that criticize is the preferred spelling in American English, while both terms are common in British English. At one point in the past, British English favored criticise, but that seems to be fading in recent years. Still, some publications still use the spelling. These charts show the relative usage of criticize vs. criticise in each language community. As you can see, even in British English, criticize is actually more common. These charts aren’t 100 percent exhaustive, however, since they only look at books published in English since 1800. Still, they clearly illustrate long-term usage trends. If you want to play it safe, you should default to criticize in all contexts. It has been the more common variant in both American and British English for several decades. Americans have a proud history of changing the spelling of words to more closely reflect their pronunciations, including changing the s in criticize to a z. Since apologize also ends in -ize, it should be easy to remember that criticize is better spelled this way, as well. Is it criticize or criticise? 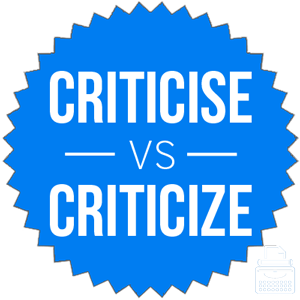 Criticize and criticise are different spellings of a verb that means to point out the faults in something. Criticise is the older spelling. Criticize has surpassed it in both American and British English. 1 What is the Difference Between Criticise and Criticize?